Lawn sprinkler pumps increase the water pressure for lawn and garden irrigation. While some of the pumps may be part of a permanent installation, other pumps are portable. All of these pumps must be winterized against freezing temperatures. If the pumps are left untreated, severe damage will occur. By taking just a few minutes you can winterize that lawn sprinkler pump against freeze damage. Close the water feed line going to the water pump. Close the outlet water valve. If the water pump is connected to an outdoor water spigot with a garden hose attachment, remove the garden hose. Disconnect the outlet side of the pump if it is connected to a garden hose. Locate the drain plug for the pump chamber. The drain plug will have a square top and is generally placed on the bottom of the round pump chamber. The round pump chamber is where the inlet and outlet water connections are made. Fit the crescent wrench or plumbers pliers over the square plug. Turn the plug in a counter clockwise direction to loosen. Remove the drain plug from the plumbing fitting. Water will exit from the opening. Tear a 3-inch piece of masking tape from the roll. Adhere the drain plug under the piece of tape. Stick the tape to the top of the pump housing chamber. This will keep you from misplacing the plug. Keep the plug stuck to the pump until spring. Do not replace the plug back into the pump until all danger of freezing weather has passed. Never blow compressed air through the vanes of a water pump. 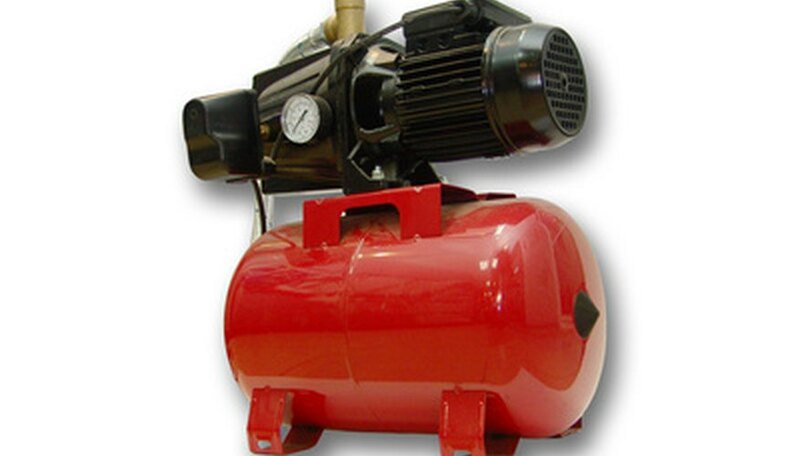 The action of the compressed air will damage the internal vanes and bearings. Exercise extreme caution if you are blowing out the irrigation system as a whole with compressed air. Most irrigation systems are pressure-sensitive and exceeding that pressure with compressed air will damage the components.